In Spain, Manchester City’s sister club Girona were in action and faced a tough challenge against Villarreal. The Catalan side had gone into the game optimistic as they sought to overturn a run of 50 days without a competitive league victory. Pablo Maffeo started but Girona’s hopes were quickly dashed, the home side finding themselves 2-0 down within the first 20 minutes through an impressive brace from Cedric Bakambu. Pablo Machín’s team were left stunned and sought to fight their way back into the game. Girona gained momentum once they pulled a goal back in the 38th minute through Cristhian Stuani and continued to press for an equaliser in the second half. Olarenwaju Kayode and Douglas Luiz collectively made an impact as Girona picked up the intensity, even hitting the woodwork with 5 minutes to go but it proved to be too little too late. Another encouraging performance from our sister club but another costly defeat. In Spain’s second tier, former Twente loanee Yaw Yeboah was left on the bench for Real Oviedo’s 2-0 defeat away at Granada. Back in England, it was an afternoon to remember for Joe Hart at West Ham. The current England number one was named the man of the match in the Hammers’ 1-1 draw away at Burnley. The goalkeeper made four saves, three punches, three clearances and even picked up an assist on a near-perfect afternoon. His long ball flew over former City defender Ben Mee and landed perfectly for Michail Antonio to tuck away the opener. Hart is now the 51st goalkeeper to provide an assist in the Premier League. In the second tier, Angus Gunn was also involved in a 1-1 draw as Norwich City extend their unbeaten run to eight with a point against Hull. Their next opponents are Ipswich Town in the East Anglian derby, who now sit a point behind their rivals after their 1-0 defeat to Sheffield United. 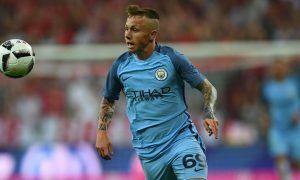 Bersant Celina was once again left on the bench by Mick McCarthy. The Kosovan playmaker was brought on in the 73rd minute but was unable to make an impact as Ipswich fell to back to back defeats. Meanwhile, in League 1, Rodney Kongolo is continuing to make waves at Doncaster Rovers. The Dutch midfielder featured for 82 minutes in their 1-0 defeat away at Charlton Athletic. The 19-year-old was named the Man of the Match on social media, picking up 35% of the vote. Kean Bryan continues to make his mark at Oldham in his makeshift position of centre-back. The natural holding midfielder has been deployed in defence and worked hard to ensure Oldham picked up a valuable 3 points with a 1-0 victory against Blackburn Rovers. While in Scotland, Patrick Roberts was named Man of the Match after putting in a fine display for Celtic in their 1-0 victory against Dundee. The victory sees Brendan Rodgers’ side retain their spot at the top of the SPL, tied on points with Aberdeen. Closely behind in third are Rangers who defeat St Johnstone 3-0 away on Friday evening. Aaron Nemane was named on the substitutes bench and was brought on in the 90th minute to see out the final few minutes. Meanwhile, Hibernian couldn’t match their same success as they fell to a 1-0 home defeat to Aberdeen. Brandon Barker was brought on in the 66th minute but was unable to make an impact with Neil Lennon’s side now falling to 6th in the division and face a tough challenge in Celtic on Saturday in the Semi Final of the League Cup. In Holland, affiliate side NAC Breda are struggling to find consistency in the Eredivisie. Angelino, Pablo Mari, Manu Garcia and Thierry Ambrose started as NAC Breda fell to a 1-0 home defeat away at Roda JC. The defeat leaves our sister club just one point above the relegation zone and they have an important fixture this Saturday evening against PEC Zwolle. In and around the relegation places also sit FC Twente who fell to a 3-1 defeat away at Willem II. Isaac Buckley-Ricketts was brought on in the 65th minute with the away side chasing the game and inevitably fell to their 6th defeat of the season. There has been some rumours surrounding the future of Buckley-Ricketts at Twente, the young English forward has struggled for game time in Holland and it is believed that he could be making the move back to England in January with an offer from Bolton reportedly on the cards. Elsewhere, Jason Denayer is finding his feet again at Galatasaray. The young Belgian defender started at the weekend as the Turkish leaders 2-0 away win at Konyaspor. While the same cannot be said for New York City as they fell to a 2-1 defeat away at New England Revolution. Yangel Herrera featured as continues his comeback from injury, and produced a solid performance, however Patrick Vieira’s side were destined to struggle as they were reduced to 10 men early on as Jack Harrison was given a red card. New York City sit second in the MLS, their highest position yet after 33 games and look set to make the MLS Cup playoffs.